Sorry to learn of the passing of Richard D. Trentlage, erstwhile banjo-ukulele player and composer of the beloved Oscar Mayer Wiener jingle. Read about Mr. Trentlage's storied career and see one of the original TV spots at he The New York Times. Here's an article from the 50th anniversary of the song in 2012. 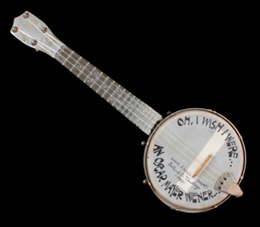 And finally, a link to the final resting place of Mr. Trentlage's Werco banjo-ukulele (pictured above), upon which he composed The Oscar Mayer Wiener song, at the Wisconsin Historical Society.